HUNTINGTON BEACH — The Wintersburg/Furuta Fountain and Courtyard will be dedicated on Saturday, March 16, from 2 to 4 p.m. at LUCE, 7290 Edinger in Huntington Beach. Part of a series of connected artworks using natural materials, water and light to create pathways, beacons and destinations, this is the first permanent public art installation honoring the Japanese pioneer history of Wintersburg Village, now part of Huntington Beach. 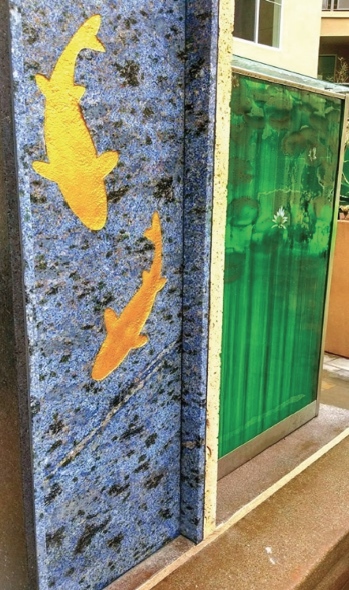 Los Angeles-based artist Michael Davis’ fountains and courtyards honor the contributions of the Furuta family and other early immigrants in symbolic iconography with goldfish reliefs (a reference to the Furuta Goldfish Farm), blue granite symbolizing water, and lily-patterned glass representing agricultural history. Special guests will include members of the Furuta family, some of whom will be flyign in; Huntington Beach Mayor Erik Peterson, who will provide remarks; and Nancy Teramura Hayata, who will peform a classical Japanese dance. Davis, who will take part in the dedication, works in the fields of drawings, sculptures, installation art and public art. He maintains a studio in San Pedro. He was included in a compilation of Los Angeles artists, “L.A.Rising: SoCal Artists Before 1980” by Lynn Kienholz, which documented the work of 500 important artists working in Los Angeles during the growth of the seminal art scene. Public parking is available in the LUCE garage. For more information on LUCE, call (714) 655-8734 or visit http://LiveLuce.com. Historic Wintersburg was designated a National Treasure in 2015, one of America’s 11 Most Endangered Historic Places in 2014, and one of Orange County’s Most Endangered Historic Places in 2017. The 4½-acre property has over a century of history. Historic Wintersburg was a goldfish and flower farm, and home to one of the oldest Japanese missions in Southern California, of any denomination, founded in 1904. The property and its six historic structures remain endangered. Historic Wintersburg also is a civil rights “site of conscience.” Everyone associated with the farm and mission were confined during World War II due to their Japanese ancestry. The majority were U.S. citizens. For more information, visit https://historicwintersburg.blogspot.com.